My kids and I have been spending countless hours at other people’s pools this summer. I know, tough life. In summers past I avoided the pool like the plague for a myriad of cellulite and drowning-induced reasons, but something’s different this summer and I don’t exactly know what it is. Maybe it’s me, or life, or my place in this this life. All I know is that I just want to get out and do and smile and feel more than the confines of my house allow me to. So this summer the pool and I are simpatico. For the first time ever we seem to have reached an understanding. And it seems there are like, life lessons to be found at the pool. More than simply a place to escape the summer heat, the pool can actually teach you stuff if you let it. For serious. I swear other people’s pools hold the answers to life’s questions. Take a look at 4 totally deep (get it, deep?) 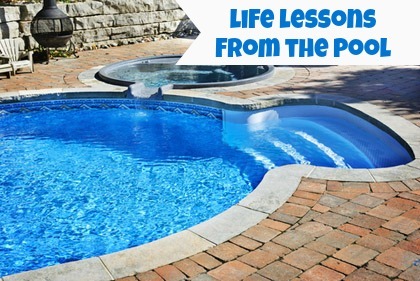 life lessons learned from the pool this summer.